Stormé DeLarverie (December 24, 1920 – May 24, 2014) was a butch lesbian whose scuffle with police was, according to Stormé and many eyewitnesses, the spark that ignited the Stonewall riots, spurring the crowd to action. She was born in New Orleans, to an African American mother and a white father. She is remembered as a gay civil rights icon and entertainer, who graced the stages of the Apollo Theater and Radio City Music Hall. She worked for much of her life as an MC, singer, bouncer, bodyguard and volunteer street patrol worker, the "guardian of lesbians in the Village." She is known as "the Rosa Parks of the gay community. " DeLarverie's father was Caucasian. Her mother was African American. Her mother worked as a servant for his family. According to DeLarverie, she was not certain of her actual date of birth. She celebrated her birthday on December 24. As a child, DeLarverie faced bullying and harassment. She rode jumping horses with the Ringling Brothers Circus when she was a teenager. She stopped riding horses after being injured in a fall. She realized she was gay near the age of eighteen. Her partner, a dancer named Diana, lived with her for about 25 years until Diana died in the 1970s. According to friend Lisa Cannistraci, DeLarverie carried a photograph of Diana with her at all times. It was a rebellion, it was an uprising, it was a civil rights disobedience — it wasn't no damn riot. At the Stonewall rebellion, a scuffle broke out when a woman in handcuffs, who may have been Stormé, was roughly escorted from the door of the bar to the waiting police wagon. She was brought through the crowd by police several times, as she escaped repeatedly. She fought with at least four of the police, swearing and shouting, for about ten minutes. Described by a witness as "a typical New York butch" and "a dyke-stone butch," she had been hit on the head by an officer with a baton for, as one witness stated, announcing that her handcuffs were too tight. She was bleeding from a head wound as she fought back. Bystanders recalled that the woman, whose identity remains uncertain (Stormé has been identified by some, including herself, as the woman, but accounts vary),[a] sparked the crowd to fight when she looked at bystanders and shouted, "Why don't you guys do something?" After an officer picked her up and heaved her into the back of the wagon, the crowd became a mob and went "berserk": "It was at that moment that the scene became explosive." Some have referred to that woman as "the gay community's Rosa Parks". "'Nobody knows who threw the first punch, but it's rumored that she did, and she said she did,' said Lisa Cannistraci, a friend of DeLarverie and owner of the Village lesbian bar Henrietta Hudson. 'She told me she did.'" From 1955 to 1969 DeLarverie toured the black theater circuit as the MC (and only drag king) of the Jewel Box Revue, North America's first racially integrated drag revue. The revue regularly played the Apollo Theater in Harlem, as well as to mixed-race audiences, something that was still rare during the era of Racial segregation in the United States. DeLarverie, who cut a striking, handsome presence, inspired other lesbians to adopt what had formerly been considered "men's" clothing as street wear. She performed as a baritone. She was photographed by renowned artist Diane Arbus. 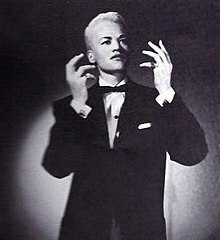 During shows audience members would try to guess who the “one girl” was, and at the end Stormé would reveal herself as a woman during a musical number called, “A Surprise with a Song,” often wearing tailored suits and sometimes a moustache that made her “unidentifiable” to audience members. She drew inspiration from Dinah Washington and Billie Holiday and her drag and subversive performances became celebrated and influential during the era and throughout drag. In 1987 Michelle Parkerson released the first cut of the movie, Stormé: The Lady of the Jewel Box, about DeLarverie and her time with the revue. DeLarverie's role in the Gay liberation movement lasted long after the uprisings of 1969. In the 1980s and 1990s she worked as a bouncer for several lesbian bars in New York City. She was a member of the Stonewall Veterans' Association, holding the offices of Chief of Security, Ambassador and, in 1998 to 2000, Vice President. She was a regular at the gay pride parade. For decades Delarverie served the community as a volunteer street patrol worker, the "guardian of lesbians in the Village." Tall, androgynous and armed — she held a state gun permit — Ms. DeLarverie roamed lower Seventh and Eighth Avenues and points between into her 80s, patrolling the sidewalks and checking in at lesbian bars. She was on the lookout for what she called "ugliness": any form of intolerance, bullying or abuse of her "baby girls." ... "She literally walked the streets of downtown Manhattan like a gay superhero. ... She was not to be messed with by any stretch of the imagination. In addition to her work for the LGBT community, she also organized and performed at benefits for battered women and children. When asked about why she chose to do this work, she replied, "Somebody has to care. People say, 'Why do you still do that?' I said, 'It's very simple. If people didn't care about me when I was growing up, with my mother being black, raised in the south.' I said, 'I wouldn't be here.'" For several decades, DeLarverie lived at New York's famous Hotel Chelsea, where she "thrived on the atmosphere created by the many writers, musicians, artists, and actors." Cannistraci says that DeLarverie continued working as a bouncer until age 85. DeLarverie suffered from dementia in her later years. From 2010 to 2014, she lived in a nursing home in Brooklyn. Though she seemingly didn't recognize she was in a nursing home, her memories of her childhood and the Stonewall Uprisings remained strong. On June 7, 2012, Brooklyn Pride, Inc. honored Stormé DeLarverie at the Brooklyn Society for Ethical Culture. Michelle Parkerson's film. Stormé: The Lady of the Jewel Box, was screened. On April 24, 2014 DeLarverie was honored alongside Edith Windsor by the Brooklyn Community Pride Center, "for her fearlessness and bravery" and was also presented with a proclamation from New York City Public Advocate, Letitia James. She died in her sleep on May 24, 2014 in Brooklyn. No immediate family members were alive at her time of death. Lisa Cannistraci, who became one of DeLarverie's legal guardians, stated that the cause of death was a heart attack. She remembers DeLarverie as "a very serious woman when it came to protecting people she loved." A funeral was held May 29, 2014 at the Greenwich Village Funeral Home. ^ a b c d e f g h i j k l m n o Chu, Grace (2010-07-26). "From the Archives: An interview with lesbian Stonewall veteran Stormé DeLarverie". AfterEllen.com. Retrieved 2017-10-11. ^ Goethals, George (2004). Encyclopedia of Leadership - Volume 1. Thousand Oaks: Berkshire Publishing Group LLC. p. 1494. ISBN 0-7619-2597-X. ^ a b c d e f g h i j k l m n Yardley, William (May 29, 2014) "Storme DeLarverie, Early Leader in the Gay Rights Movement, Dies at 93" in The New York Times. ^ Gremore, Graham (2014-05-27). "Stormé DeLarverie, "Rosa Parks" Of The Gay Rights Movement, Dies At 93". Queerty. Retrieved 2015-03-22. ^ a b "Stormé DeLarverie — the gay community's "Rosa Parks" — to be honored this Thursday at the 2014 Founders' Ball". henriettahudson.com. 2014-04-24. Retrieved 2015-03-22. ^ a b c Potts, Andrew (2014-05-28). "Stonewall Riots veteran Storme DeLarverie dies at 93". gaystarnews.com. Retrieved 2015-03-22. ^ a b c d e Bendix, Trish (2014-05-27). "Stormé DeLarverie passes away, the community loses a legend". gaystarnews.com. Retrieved 2015-03-22. ^ a b K, Kristi (2014-05-28). "Something Like A Super Lesbian: Stormé DeLarverie (In Memoriam)". thekword.com. Retrieved 2015-03-22. ^ "K. Stormé DeLarverie, "Storme on Stonewall"". STONEWALL Veterans' Association. Retrieved 30 December 2018. ^ Williamson, K. Storme DeLarverie w/. "Stormé DeLarverie, S.V.A. Stonewall Ambassador * Jewel Box Revue * Imperial QUEENS & Kings of NY". www.stonewallvets.org. Retrieved 2017-10-12. ^ a b "Women Make Movies | Storme The Lady of the Jewel Box". Wmm.com. Retrieved 2010-08-01. ^ a b Press, DEEPTI HAJELA Associated. "Stonewall activist Storme DeLarverie dies at 93". sandiegouniontribune.com. Retrieved 2017-10-12. ^ a b Fernandez, Manny (June 27, 2010). "A Stonewall Veteran, 89, Misses the Parade". New York Times. ^ West, Robert (2013-03-26). "Stormé DeLarverie: In a Storm of Indifference, She's Still a Jewel". Huffington Post. Retrieved 2017-10-12. ^ Nast, Condé. "A Drag King's Journey From Cabaret Legend to Iconic Activist". them. Retrieved 2019-02-13. ^ "Long Live the Legacy of Storme DeLarverie". Vocativ. 2014-06-27. Retrieved 2019-02-13. ^ The gay & lesbian theatrical legacy ... - Google Books. Books.google.com. Retrieved 2010-08-01. ^ a b "Stonewall Veteran, Drag King Icon Stormé DeLarverie Dies At 93". 2014-05-27. Retrieved 2017-10-12. ^ Press, DEEPTI HAJELA Associated. "Stonewall activist Storme DeLarverie dies at 93". sandiegouniontribune.com. Retrieved 2017-12-15. Fernandez, Manny (June 27, 2010). "A Stonewall Veteran, 89, Misses the Parade". New York Times. This page was last edited on 22 March 2019, at 20:04 (UTC).